Every business needs Business Cards, however, not all have looked at the options provided by Full Colour Printing. We can offer you cards with photographs, full colour logos, in fact anything that can possibly be printed in living colour. Create your very own customised business cards for an incredible price. 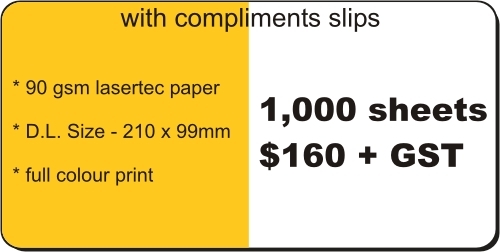 Price includes setup costs, if artwork is “print ready”, or simple text only. If alteration is required to artwork modification charges will apply. For additional options and quantities, please visit the contact us page. Stationary is an essential part of any business. You can customise all of your stationary needs – from letterheads and envelopes, to note and desk pads. 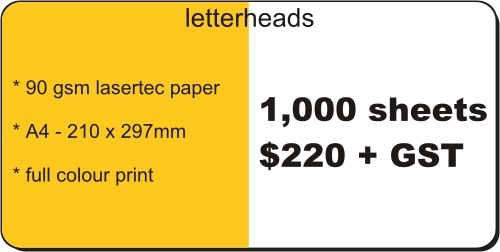 Price includes setup costs, if artwork is “print ready”, or simple text only. If alteration is required to artwork, modification charges will apply.